Overall, iPhone SE is largely similar to its iPhone 5s forebear, an unsurprising development considering the device is merely an iPhone 5 series shell stuffed with refreshed components. 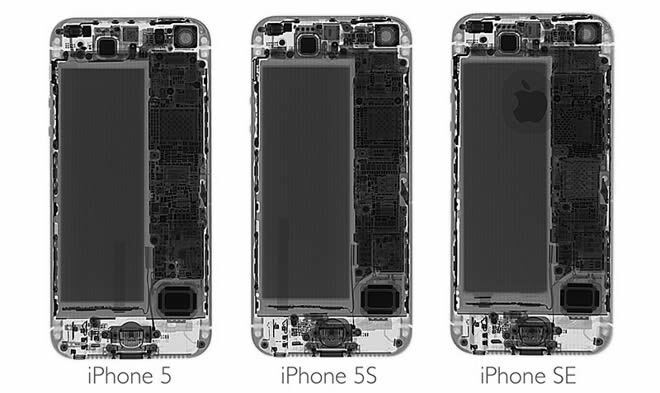 As noted in yesterday's Chipworks teardown, iPhone SE's internal design, including the logic board , is identical to 2014's iPhone release. Be sure to read “AAA Research Into Distraction Finds Hands-free Isn’t Risk-free” near the end of this issue. It might save your life. Today is the official release day for the iPhone SE, and I was fortunate enough to be able to pick up my unit early this morning. For those of you who will likewise acquire an iPhone SE in the near future, or for those of you who are still unsure about a purchase, have a look at our hands-on video that touches on the top 15 iPhone SE features. We also have a brief look at some of the downsides of the iPhone SE for those wanting a balanced look at the latest new iPhone. This is hands-down one of the biggest “features” of the new 4-inch iPhone SE. In fact, it’s the main driving force behind its creation. The bottom line is that a lot of people don’t want a big smartphone. For some, such as my wife, even the 4.7″ iPhone 6s is deemed impractical. Apple said that it sold 30 million 4-inch iPhones last year, so my wife certainly isn’t alone in her sentiments. If the A7-equipped iPhone 5s was your last iPhone, you’re going to be blown away by the speed of the iPhone SE’s A9 system on a chip. This device, from a pure processor performance perspective, is essentially an iPhone 6s in a smaller form-factor. Considering that the iPhone 6s is Apple’s current flagship device, that’s kind of a big deal. The iPhone SE features some definite downsides when compared to its big brothers, but chip performance isn’t one of them. 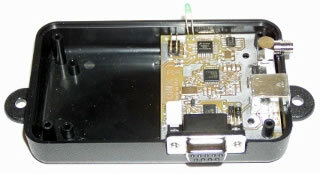 The aforementioned A9 chip features an M9 motion co-processor embedded on the same die. The iPhone 5s, with its A7/M7 combo was the first device to feature the embedded motion co-processor, which collects, processes, and stores sensor data even when the iPhone is asleep. The latest M9 motion co-processor brings always-on “Hey Siri” functionality that can be used even when the iPhone is disconnected from a power source. 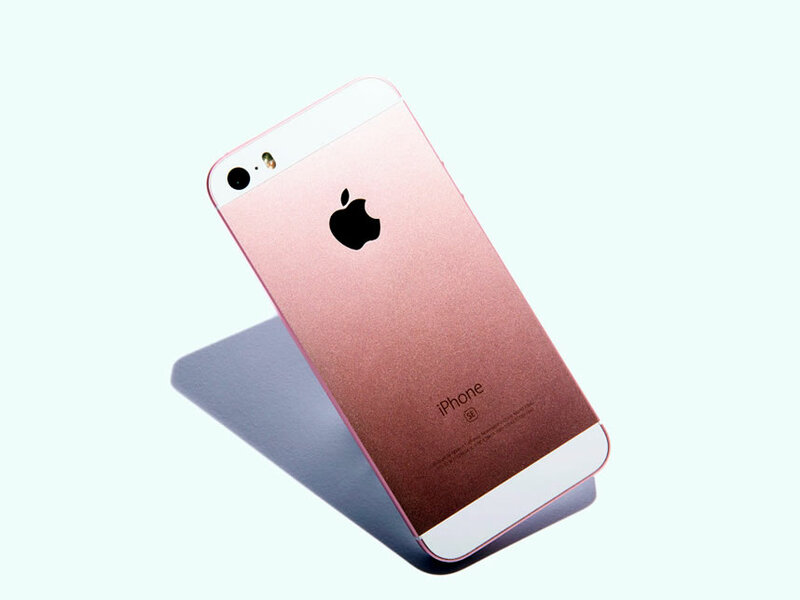 The iPhone 5s was the first iPhone to be made available in a gold color, so it’s only right that a device that shares many of the same physical characteristics ships with a rose gold color. 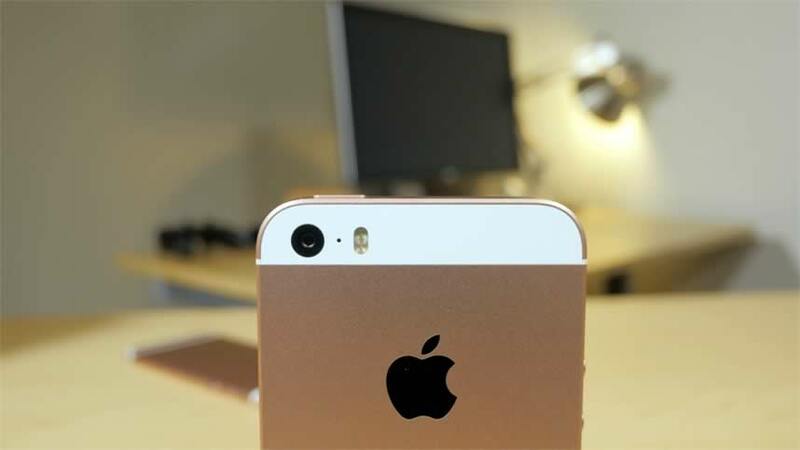 Instead of a stamped on Apple logo like the iPhone 5s, the new iPhone SE features a color-matched stainless steel inset Apple logo for a more premium look and feel. The iPhone 5s, to me, is the best iPhone design of all time. I was a bit worried that the newly redesigned chamfered edges, which are now more of a matte variety, would compromise the look. Thankfully, I wouldn’t say that the new edges look bad at all — just different. Apple describes the new edges as being refined, and I’d say that’s a fair description. The edges on the old iPhone 5s were easy to knick and scratch as well, so I’m hoping that the new edges will hold up better from a wear and tear perspective. Apple never advertises the amount RAM it includes in its mobile devices, but benchmarks show that the new iPhone SE features double the RAM of the iPhone 5s. It’s a well known fact that 2GB of RAM in an iOS device seems to be the sweet spot with recent versions of iOS. It’s not enough for a modern iOS device to ship with 1GB of RAM, as this results in slow performance, and Safari pages that often force-refresh. The fact that the iPhone SE ships with 2GB of RAM is alone enough to warrant an upgrade over a lesser device. In its heyday, the iPhone 5s’ 8-megapixel iSight camera was pretty good, but the camera featured in the iPhone SE is straight out of the iPhone 6s, which many consider to be among the best smartphone cameras available right now. Like the iPhone 6s, the iPhone SE iSight camera is rated at 12-megapixels and an ƒ/2.2 aperture. Despite the improved camera, there’s no camera bump to be found on the iPhone SE, and design purists will definitely appreciate this. The lack of a camera bump can likely be partly credited to the iPhone SE’s slightly thicker design. If you’re into shooting video, then the iPhone SE’s upgrade to 4K is a compelling one. Not only can the iPhone SE shoot 4K video, but it can also edit multiple streams of 4K video in iMovie. Even if you don’t own a 4K monitor or television, the benefits of such high resolution are multi-faceted. For instance, you can use 4K videos to perform artificial pans and zooms in your editing software of choice, while still maintaining enough resolution for 1080p output. Again if video is your thing, then upgrading to an iPhone SE makes sense. Like the iPhone 6s, the SE can shoot super-smooth slow-motion video at 240fps (720p) and regular 120fps slow-motion (1080p) . The iPhone 5s was only capable of shooting 120fps at 720p. A feature that first appeared on the iPhone 6s, Retina Flash provides flash illumination for the front-facing FaceTime camera. Retina Flash uses your iPhone’s display and a custom display chip that allows the screen to flash three times brighter than it normally does. The tech uses a preflash to measure current lighting conditions, followed by a True Tone flash to match ambient light for a better-looking shot. Unfortunately, as we’ll discuss a bit later, your selfies won’t look as good as they do on an iPhone 6s, because the iPhone SE features the same front-facing FaceTime camera specs as the nearly three year old iPhone 5s. The iPhone 5s already allows users to view Live Photos, but with the iPhone SE, you can both view and create Live Photos. The Live Photos feature first debuted with the iPhone 6s, and it lets you capture movement and sound just before and right after a photo is taken. The result is a photo that comes to life with a long-press on the screen, and Live Photos briefly animate as you swipe through your photo library. 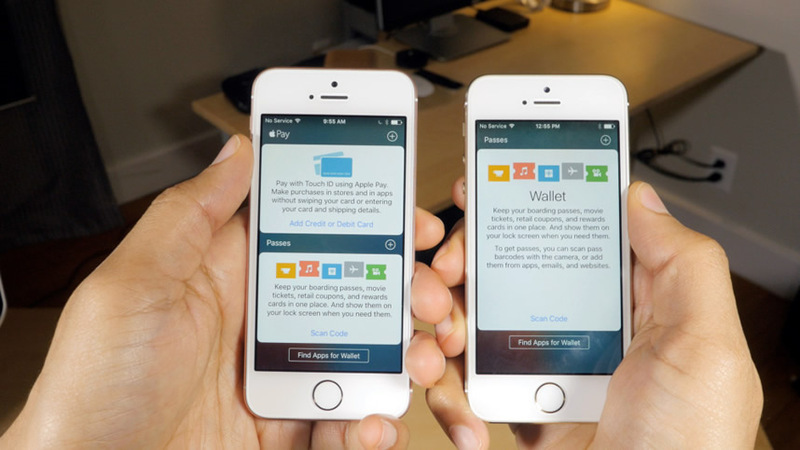 The iPhone 5s shipped before Apple Pay was a thing, so the only way to use Apple Pay on the iPhone 5s is when it’s paired with an Apple Watch. With the iPhone SE, though, Apple Pay can be used natively on device thanks to its NFC chip and secure enclave. The iPhone SE is hands-down faster when it comes to both Wi-Fi and cellular coverage when compared to the iPhone 5s. The SE supports 802.11ac for Wi-Fi and features 19 LTE bands with a maximum speed of up to 150 Mbps. The SE also sports the latest in Bluetooth, version 4.2. True, your theoretical speeds won’t be as fast as they are on the iPhone 6s, but it’s still an upgrade over the iPhone 5s. The display is usually the most power-hungry component on a smartphone or tablet, and the iPhone SE is no different. But thanks to the device’s diminutive screen, it can still hang with, and at times surpass the bigger iPhone models, even though there is less physical space for batteries. The iPhone SE gets 13 hours of video playback, and 13 hours of Internet use on LTE and Wi-Fi. 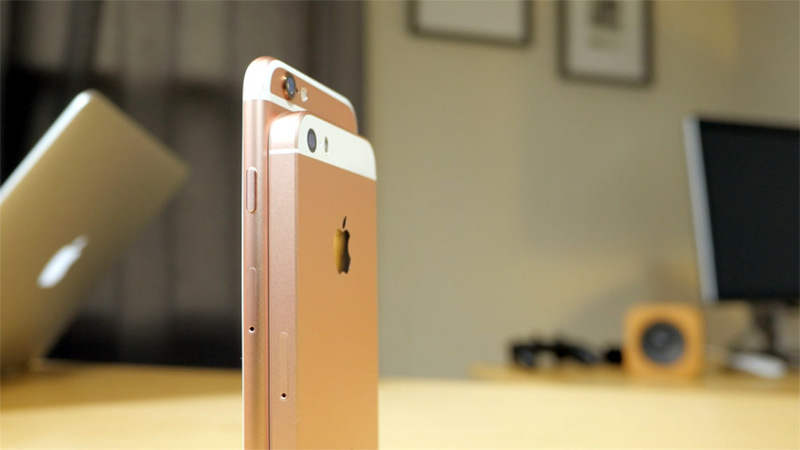 The iPhone 6s gets 11 hours of video playback, 10 hours of Internet use on LTE, and 11 hours of use on Wi-Fi. 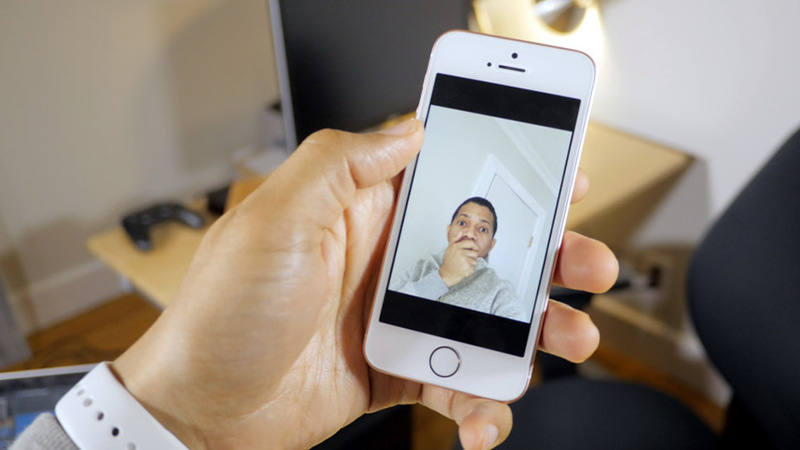 For the iPhone SE, Apple is using the same FaceTime camera specs found in the iPhone 5s. To me, this is the iPhone SE’s most disappointing feature. It’s disappointing in part because the iSight camera got such a massive upgrade, while the FaceTime camera is left to lag behind with only 1.2-megapixels and a smaller aperture. It’s even more disappointing when you consider that Apple implemented its new Retina Flash technology in the SE, which significantly improves the quality of selfies taken in less than ideal lightning. Yes, selfies will look better in dark places, but the inferior quality of the FaceTime camera is still a major bottleneck to taking a good photo. The contrast ratio on the iPhone SE is the same as the iPhone 5s: 800:1. If you’re coming from an iPhone 5s, this isn’t a big deal. But if you’re coming from a larger iPhone 6s or iPhone 6s Plus — phones that feature 1400:1 and 1300:1 contrast ratios — you’ll likely notice. If you’re coming from one of Apple’s bigger iPhones, you may also miss the Dual-domain pixels, which improve viewing angles. For those who consider the iPhone 6s’ second-generation Touch ID sensor to be too fast, this could be a good thing. For the rest of us who love the instantaneous response of the second-generation sensor, it’s a downgrade, but certainly not a deal-breaker. 3D Touch, the flagship feature of the iPhone 6s, is nowhere to be found on the iPhone SE because the iPhone SE is using the same display tech as the original iPhone 5s. Although I use 3D Touch on my 6s, not having it isn’t something that would automatically disqualify a purchase of the iPhone SE in my eyes. Of course, I’d be happy if 3D Touch was included in the iPhone SE, but like the 2nd-gen Touch ID sensor, it’s not a make or break feature. As someone upgrading from an iPhone 5s, this isn’t a big deal at all, since the screen size is the same. But maybe you’re thinking of upgrading from an iPhone 6, or are considering transitioning from an iPhone 6s to an iPhone SE? The form factor may be more ideal, but the amount of screen real estate you lose is beyond noticeable. 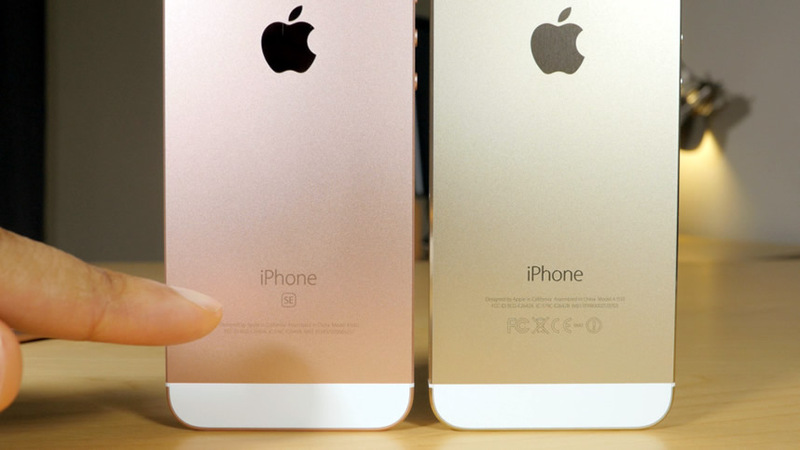 You’re giving up a lot of space by switching from a larger iPhone to the smaller 4″ iPhone SE. Although it’s definitely doable, it’ll take some time to get used to such a smaller screen area. If you’re an iPhone 5s owner who’s been holding out for an iPhone with a similar form factor, then this is the iPhone you’ve been waiting for. Outside of a few areas, this isn’t last years tech jammed into an iPhone 5s. No, this is almost like taking an iPhone 6s, Apple’s latest and greatest iPhone, and stuffing into the body of a refined iPhone 5s. Yes, there are a few disappointments to be found, headlined by the lack of an improved FaceTime camera, but for an entry-level price of $399 for the 16GB model, it’s hard to find fault. The iPhone SE is hands-down the best 4″ smartphone ever, and in many ways, it can go toe-to-toe with Apple’s much pricier flagship offerings. If the firm succeeds the FBI will be able to drop requests for help from Apple, reported Yedioth Ahronoth, as quoted by Reuters. 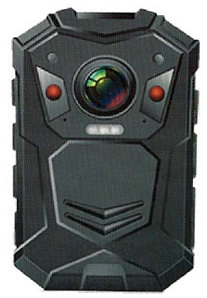 The paper didn't say how Cellebrite was attempting to break into the phone, or what kind of progress it might be making. On Monday, the U.S. Department of Justice asked a federal court to postpone a Tuesday hearing intended to review the order asking Apple to build a passcode limit removal for the FBI. A filing indicated only that "an outside party" had shown the FBI a possible means of unlocking Farook's phone, and that if successfully tested it would negate the need to recruit Apple. The government has until April 5 to update the court, and Apple said it will be asking for further information on the vulnerability. 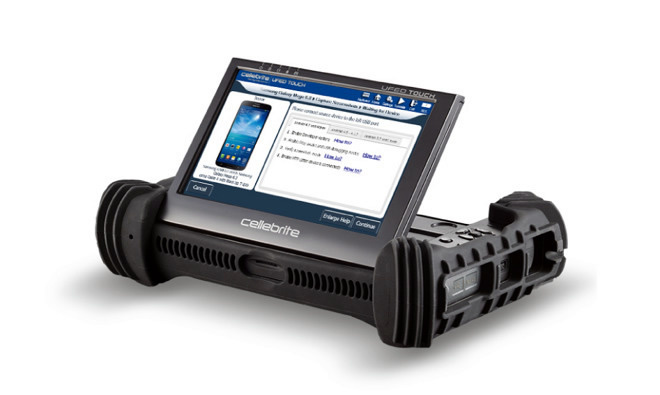 Should Cellebrite's option not work, courts may once again have to test the FBI's interpretation of the All Writs Act. A decision one way or another could set a major precedent, either limiting or unleashing the amount of help U.S. law enforcement can recruit when trying to bypass encryption. Apple has argued that such a precedent could be dangerous both domestically and internationally, and that compelling the creation of new software is tantamount to compelling speech. It has also suggested that the order would undermine iOS security, exposing it not just to law enforcement and spy agencies but to hackers and criminals. Conversely, some in government have expressed concerns about the Internet "going dark" to legal searches and warrants, since criminals and terrorists can theoretically hide behind encrypted apps and operating systems. IF YOU’RE AMONG the multitudes who purchased a new iPhone SE, you’re likely in a rush to integrate your new device into your day-to-day. Photos, contacts, videos, message history, music, calendars, mail accounts, and many of your apps can all be transferred to your new Apple handset, whether you’re changing teams from Android to Apple, or you’re already an Apple user. Use either iTunes or iCloud to make a backup of your old device. To save Health and Activity data and backup using iTunes, choose the option to encrypt your backup or else iTunes will not save it; not saving unencrypted Health and Activity data is a default privacy feature. All iCloud backups are encrypted automatically. Once you’re fully backed up, turn off your old device. If you have a SIM card that you want to use in the new phone, remove it from the old phone and put it in the new one. Turn on your new iPhone and follow all the steps on the Hello screen until you reach the screen that asks if you want to join a Wi-Fi network. Choose the network you wish to join. While still on that Wi-Fi screen: If you used iTunes to back up your data, plug your phone into your computer and tap on “Connect to iTunes,” then continue through the setup process until you reach the Apps & Data screen. Once there, tap the “Restore from iTunes Backup” option. If you used iCloud to back up your phone, continue through the setup process until you reach the Apps & Data screen and tap the “Restore from iCloud Backup” option. Choose the backup that you want to use. They’re time-stamped, so be sure to look at the date and size of the backup to make sure you’re picking the correct one. If you set up multiple Apple IDs, you’ll be promoted to sign into each one, but you can ignore this headache by choosing the option of not using an Apple ID. Or if you’re forgetful, consider installing a password manager on your desktop computer to find and store old login information. Don’t disrupt the Wi-Fi connection until the backup is totally done. Disconnecting early will cause your backup to pause until you reconnect. Same with the tethered option—leave your phone plugged into iTunes until the update is done. Install the Move to iOS app on your Android device. In the setup process on your new iPhone, stop when you get to the Apps and Data screen. From there choose the “Move Data from Android” option. On your Android phone, go through the transfer process in the Move to iOS app until you reach the Find Your Code screen. Pick up your iPhone and choose the option to move your data from Android, then wait for a ten digit code to show up on your iPhone. Enter that code onto your Android device. When the Transfer Data screen appears on your device, pick the content that you want to transfer. 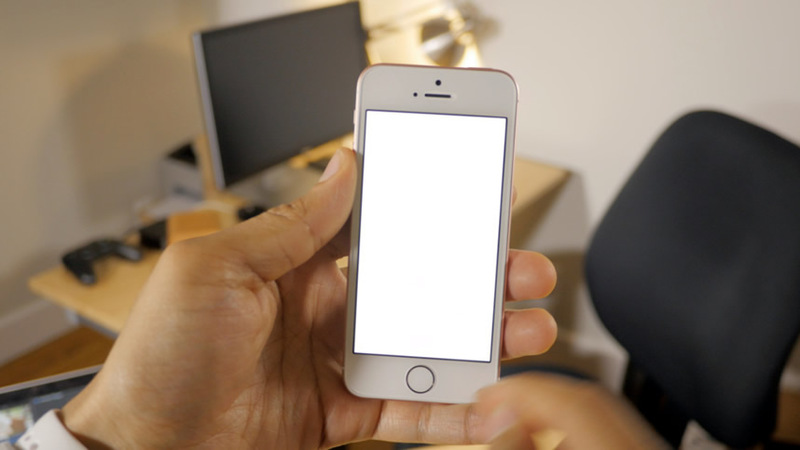 Although the process may take a while, don’t discontinue or unplug your phones until the loading screen says it’s finished. Finish setting up your new iPhone. What ever data did not transfer automatically can most likely be moved manually. Reference Apple’s tips for manually transferring specific types of content. If you’ve already fired up your new iPhone without transferring anything, you’ll have to either erase it and start over, or transfer your content manually, but that’s going to be a lot more work than doing a full transfer all at once. The highly anticipated broadcast incentive auction officially began Tuesday night with the 6 pm EDT deadline for participating TV broadcasters to make their initial commitments for surrendering some or all of their spectrum usage rights at the opening (highest) bid price. Tuesday’s deadline was an important “first step” in the reverse auction phase of the proceeding, in which allows broadcasters voluntarily give up their spectrum rights in exchange for a share of the proceeds when the spectrum is repackaged and offered to the highest bidder in a more traditional forward auction that is expected to begin this summer. With commitments in hand, the FCC must now use specialized software to “repack” the remaining broadcasters into a smaller segment of the TV band and identify its initial clearing target. This process is expected to take 3 to 4 weeks. Depending on the number of participating broadcasters and their election choices, possible 600 MHz band scenarios could repurpose anywhere from 42 to 126 megahertz of spectrum for wireless broadband services (with 84 megahertz projected), in 5 MHz x 5 MHz paired blocks. After the initial clearing target is announced, the FCC will start the reverse auction with successively lower prices offered in each round for each of the spectrum relinquishment options. That phase of the auction will stop when the FCC recovers its targeted amount of spectrum for the lowest total price. An unspecified number of the 1,800 eligible broadcasters submitted applications last January to bid in the reverse auction, and the identity of these participants is a closely held secret. Last week, the FCC announced it received 104 applications for the forward auction. The identity of bidders in the forward auction is not secret, but their market/license choices are. Additionally, bidders are subject to strict prohibitions on auction-related communications. Hopeful bidders in the forward auction include major wireless carriers like Verizon, AT&T and T-Mobile US, pay-TV providers like Comcast Corp and Dish Network Corp., and deep-pocketed DEs managed by Aloha Partners founder Charlie Townsend and minority Wall Street investor David Grain. At least twenty forward auction applicants are seeking eligibility for the Commission’s new rural service provider credit. Bidding in the forward auction is not expected to begin until June or July and it may run into the fall. Analysts have forecast that the upcoming auction could see proceeds in the $15 billion to $45 billion range, but they also said they expect bidders to be less aggressive than in last year’s AWS-3 auction, which attracted a record $44.9 billion in bids. FCC Chairman Tom Wheeler said that the FCC has seen strong interest in the auction and will boost wireless data. "If broadband Internet service is an engine for economic growth, then mobile broadband has been its booster rocket, creating a platform for innovation, competition and new markets," he said. On March 29, the FCC’s Wireline Competition Bureau (“Bureau”) issued a Public Notice seeking to refresh the record in the proceeding regarding Sandwich Isles Communications, Inc. (Sandwich Isles) and its cable network lease costs submitted for cost recovery through the National Exchange Carrier Association (NECA) pool. Comments are due April 18, and reply comments are due April 28. On September 29, 2010, the Bureau released a Declaratory Ruling addressing whether certain lease expenses incurred by Sandwich Isles were costs that were “used and useful” and could be included for recovery in the NECA pool. Specifically, the Bureau found it was reasonable to include 50% of “the lease expenses subject to dispute” in the revenue requirement, relying on a finding of certain “equitable considerations.” The Declaratory Ruling allowed costs to leas the cable network each year, including the maintenance and insurance costs, to the extent that they were not attributable to actual usage of the cable, plus certain engineering costs. 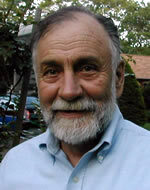 However, it excluded expenses related to the actual usage of the cable network for the provision of services covered by the NECA tariff, 100 percent of which already would be included in Sandwich Isles’ revenue requirement even absent the Declaratory Ruling, and those expenses associated with actual usage of the cable to provide services not encompassed by the NECA tariff, including, among other things, non-regulated services and intrastate services. Sandwich Isles filed a Petition for Reconsideration of the Declaratory Ruling in 2010, and AT&T filed an Application for Review that same year. More recently, NECA filed a Petition for Clarification and/or Declaratory Ruling in this docket, seeking clarification regarding particular conclusions in the Declaratory Ruling. According to the Public Notice, recent filings in the record indicate new or changed facts and circumstances that may be relevant to the Commission’s consideration. Therefore, the FCC seeks to refresh the record, and invites interested parties to comment on the outstanding petitions and application, as well as provide any and all updated information relevant to the consideration of these matters. On March 24, the FCC issued a Public Notice announcing the comment deadlines for the January 28 Notice of Proposed Rulemaking (“NPRM”) in which the FCC proposed revisions intended to strengthen the Emergency Alert System (EAS) by facilitating state and local involvement, supporting greater testing and awareness of the system, leveraging technological advances, and enhancing EAS security. Comments are due on May 9, and reply comments are due June 7.
a Notice of Proposed Rulemaking that seeks comment on proposals to expand the amount of and access to video described programming, for the benefit of consumers who are blind or visually impaired. a Third Report and Order, Further Report and Order, and Order on Reconsideration to comprehensively restructure and modernize the Lifeline program to efficiently and effectively connect low-income Americans to broadband, strengthen program oversight and administration, and take additional measures to eliminate waste, fraud, and abuse. a Notice of Proposed Rulemaking seeking comment on a proposed framework for ensuring that consumers have the tools they need to make informed choices about how their data is used and when it is shared by their broadband providers. As always, the meeting will be webcast live at the appointed hour at www.fcc.gov/live . On March 24, the FCC published notice in the Federal Register that the Office of Management and Budget (OMB) has approved, for a period of three years, the information collection associated with the Commission’s network change disclosure rules pertaining to copper retirement notices. This means that those rules became effective March 24, 2016. As a result, carriers retiring copper must now follow the public notice requirements for network change disclosures under the FCC’s rules. On March 25, the FCC’s Consumer and Governmental Affairs Bureau (“Bureau”) issued a Public Notice on three petitions seeking a waiver of section 64.1200(a)(4)(iv) of the Commission’s rules, which requires that an opt-out notice containing certain information be included in fax ads sent to a consumer who has provided prior express invitation or permission. Specifically, the Petitioners seek retroactive waivers of the opt-out notice requirement for fax ads they sent where prior express invitation or permission allegedly had been obtained from the recipient. According to the Petitioners, good cause exists because they are similarly situated to parties who were granted retroactive waivers from this requirement in the past (specifically, because of uncertainty about whether the opt-out notice applied to “solicited” faxes). On March 24, the Wall Street Journal reported that online video streaming company Netflix admitted that for more than five years it has limited its video speeds to most wireless carriers across the globe, including AT&T and Verizon, to “protect consumers from exceeding mobile data caps,” which may discourage future viewing. Given the heat that AT&T and Verizon took for allegedly throttling video data in the past, the companies were perhaps understandably annoyed. “We’re outraged to learn that Netflix is apparently throttling video for their AT&T customers without their knowledge or consent,” said Jim Cicconi, AT&T’s senior executive vice president of external and legislative affairs. According to the article, Netflix said it doesn’t limit its video quality to T-Mobile and Sprint because “historically those two companies have had more consumer-friendly policies.” That is to say, those two companies typically slow network connections when customers exceed data plans rather than charging overage fees. Since Netflix was such an outspoken supporter of net neutrality and no-throttling rules, it may seem ironic that the company is throttling its customers’ content without their knowledge. But the purpose of net neutrality is to force transmission service providers to act as true common carriers, without treating content preferentially, not to force content providers to provide service in a certain way. The real concern for wireless service providers is the easy assumption on the part of the consumer that they, and not the content provider, are the ones doing the throttling. Wireless carriers should be aware of this ironic possibility and investigate whether it is occurring on their networks. On Sunday, March 20, 2016, an outside party demonstrated to the FBI a possible method for unlocking Farook's iPhone. Testing is required to determine whether it is a viable method that will not compromise data on Farook's iPhone. If the method is viable, it should eliminate the need for the assistance from Apple Inc. ("Apple") set forth in the All Writs Act Order in this case. Accordingly, to provide time for testing the method, the government hereby requests that the hearing set for March 22, 2016 be vacated. The government proposes filing a status report with the Court by April 5, 2016. Counsel in similar cases against Apple have filed requests for stay until the government submits the above-referenced status report. If the Department of Justice ultimately withdraws its lawsuit, courts will not have the opportunity to rule on the question of whether technology companies can be compelled to help the government break the encryption on their customers' devices. On March 25, the FCC’s Wireless Telecommunications Bureau (“Bureau”) issued a Public Notice announcing its annual educational workshop on the environmental compliance and historic preservation review process required for the construction of wireless communications facilities. According to the release, this year’s workshop will include information relevant to the construction of all new communications towers and to the collocation of communications equipment on towers and other structures. Archeological surveys for communications tower construction. The workshop will be held on Wednesday, May 4, at 9:00 a.m. (EST), and will be webcast live at www.fcc.gov/live . APRIL 1: FCC FORM 499-A, TELECOMMUNICATIONS REPORTING WORKSHEET. This form must be filed by all contributors to the Universal Service Fund (USF) support mechanisms, the Telecommunications Relay Service (TRS) Fund, the cost recovery mechanism for the North American Numbering Plan Administration (NANPA), and the shared costs of local number portability (LNP). 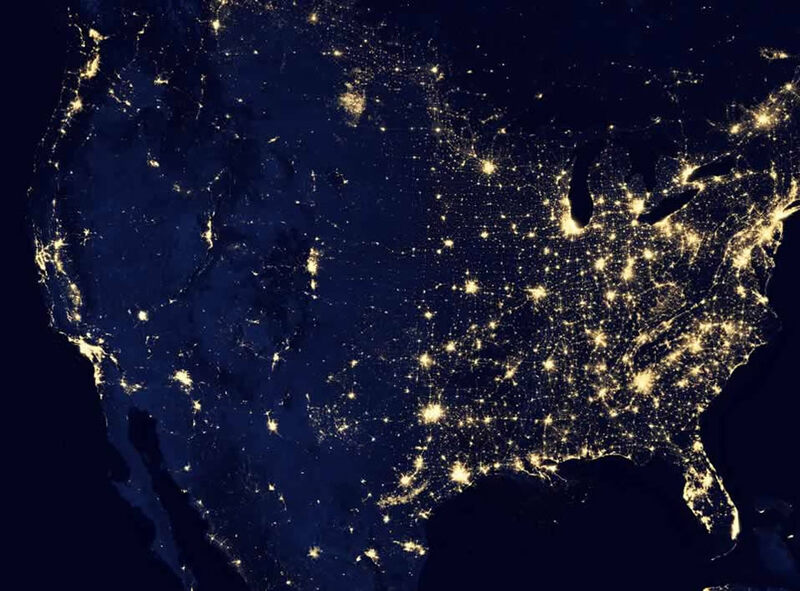 Contributors include every telecommunications carrier that provides interstate, intrastate, and international telecommunications, and certain other entities that provide interstate telecommunications for a fee. Even common carriers that qualify for the de minimis exemption must file Form 499-A. Entities whose universal service contributions will be less than $10,000 qualify for the de minimis exemption. De minimis entities do not have to file the quarterly report (FCC Form 499-Q), which was due February 1, and will again be due May 1. Form 499-Q relates to universal and LNP mechanisms. Form 499-A relates to all of these mechanisms and, hence, applies to all providers of interstate, intrastate, and international telecommunications services. Form 499-A contains revenue information for January 1 through December 31 of the prior calendar year. And Form 499-Q contains revenue information from the prior quarter plus projections for the next quarter. (Note: the revised 499-A and 499-Q forms are now available.) Block 2-B of the Form 499-A requires each carrier to designate an agent in the District of Columbia upon whom all notices, process, orders, and decisions by the FCC may be served on behalf of that carrier in proceedings before the FCC. Carriers receiving this newsletter may specify our law firm as their D.C. agent for service of process using the information in our masthead. There is no charge for this service. Mar. 30 – Comments are due on Video Programming Diversity NOI. Mar. 30 – Comments are due on Consumer Signal Boosters Public Notice. Apr. 4 – Reply comments are due on ORBIT Act Report. Jun. 1 – Deadline to increase local residential rates above $16 to avoid reductions in support. BloostonLaw has learned that the FCC’s Wireless Bureau is actively engaged in adopting rules to revise the license renewal and discontinuance of operation requirements for all licensees. The rulemaking proceeding to revisit these rules (WT Docket No. 10-112) was started in Summer 2010. 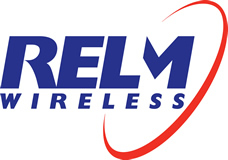 While the details are not yet known, and indications are that the Bureau is still deciding key aspects of how the new rules will operate, the key fact for our wireless clients is that they may soon be subject to new requirements that will significantly affect how they operate, and what showing they must make in their renewal application in order to justify retaining their licenses. The focus of this docket has been to adopt uniform renewal and discontinuance rules for all licensees; and to move to rules that will ensure more intense use of spectrum. 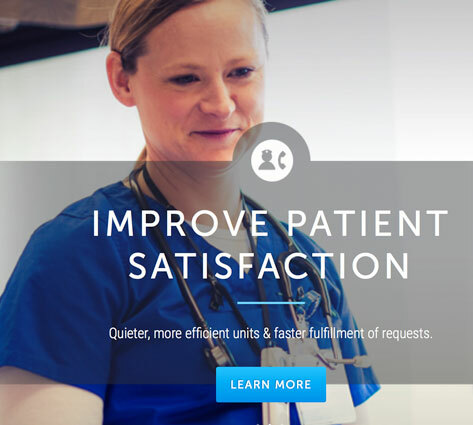 Among the proposals discussed in the docket have been a requirement for CMRS and other for profit licensees to not only have operational facilities by renewal time, but to have multiple unrelated, paying customers; and a rule that would result in the loss of a license if service is interrupted for 180 consecutive days or longer. The FCC has also proposed requiring renewal applicants to present a detailed history of their operations, including a recital of every violation ever assessed against the licensee. We will apparently find out in the near future how the final rules shape up, but it is not too early for our clients to begin sizing up how they can ensure they meet stricter construction, operation and service requirements. BloostonLaw is preparing ex parte comments on the proposed rules based on more recent developments in the wireless industry. Among the points we will emphasize: The renewal process for private radio licensees is not broken, so don’t try to fix it. Requiring a detailed compliance history is not necessary for Part 90 licensees, especially when the relevant personnel may no longer be with the company for a violation that occurred several years ago. It is possible that the FCC may issue a Further Notice of Proposed Rulemaking in this docket, but it is also entirely possible that it will go straight to adoption of new rules. The FCC has granted the Virginia State Police a waiver of its rules so that the state police may use non-trunked state channels and former reserve channels (now General Use channels) in its existing 700 MHz digital vehicular repeater units (DVRS). The Commonwealth of Virginia operates a statewide governmental radio system known as STARS in the VHF and 700 MHz bands. The Commission established trunking requirements for the narrowband public safety channels in order to promote efficient spectrum use. To that end, the FCC’s rules state that all systems using six or more narrowband General Use channels or State channels must be operated in a trunked (rather than conventional) mode. Virginia designed STARS with VHF digital trunked narrowband land mobile technology for the system infrastructure, but relied on the 700 MHz band DVRS units which are located in more than 3,600 vehicles to enable hand-held portable units to communicate through those DVRS and with the STARS infrastructure. In justifying its waiver request, Virginia noted that not only are trunked vehicle repeaters not available, but there is no Project 25 specification for a trunked vehicle repeater. Virginia also notes that trunking generally assumes fixed transmitters, but that its DVRS equipment is mobile. Virginia notes that it just recently became aware that the FCC’s requirements, if strictly construed, could be deemed to apply to Virginia’s DVRS units. In granting the waiver, the FCC found unique factors which would make application of the FCC’s rule against Virginia inequitable. In particular, the FCC found that it did not “have the DVRS units in mind when it enacted the trunking requirements, but rather contemplated that trunking would apply only to fixed infrastructure.” Further, the fact that trunked DVRS units are not available only demonstrated that it was not feasible to develop and market those types of units, or alternatively, if feasible, such units would have been extremely expensive. Finally, the FCC applied a sunset clause to the rule waiver to the earlier of one year or the effective date of an order addressing 700 MHz narrowband licensing and operational requirements for vehicular repeater systems. As we have previously reported, the jamming of cellular signals, no matter how well intentioned, is simply dangerous and illegal. Aside from the fact that jamming equipment transmits a radio frequency on licensed spectrum that is designed to prevent the use of cellular telephone communications — which can be a vital lifeline in the event of an emergency, the act of jamming violates the Communications Act which specifically prohibits malicious interference to any radio communications that is authorized by the FCC or operated by the federal government. In these two cases, R&N Manufacturing (RNM) and Taylor Oilfield Manufacturing (Taylor) had installed one or more signal jamming devices for a period of days at their work sites in order to prevent employees from placing wireless calls while at work. 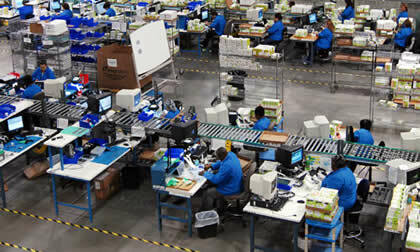 In the case of RNM, the jamming equipment was only in use during work hours and not on the weekends. Both RNM and Taylor were cooperative with the FCC’s field investigators and surrendered the cellular jamming equipment. As part of the settlement, both RNM and Taylor agreed to pay a civil penalty to the US Treasury in the amounts of $9,750 and $28,000 respectively as well as report any violations of federal statutes which prohibit the use of jamming equipment. Taylor also agreed to pay an additional $98,000 civil penalty if it defaulted on its settlement. count when attempting to contact 911. Those who use signal jamming equipment should expect affected end users to complain to the FCC. The FCC entered into a consent decree and settled its investigation into a New Jersey truck driver who was found to be operating a GPS jamming device at Newark, NJ’s Liberty International Airport. The unlawful operation caused harmful interference to the airport’s ground-based augmentation system (GBAS), which was being tested at the time. GBAS provides digital guidance for precision approaches using a Differential GPS (DGPS) for aircraft equipped with a multimode receiver. 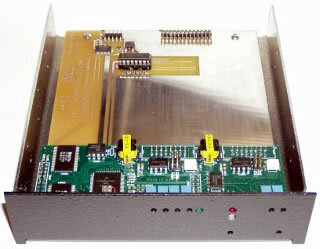 The system boosts the accuracy and integrity of GPS by transmitting corrections to the aircraft. system. The GBAS system at Newark was the first in the nation to receive operational approval in September of 2012 and United Airlines was the first to initiate regular passenger flights in the U.S. using GBAS technology. To protect the public and preserve unfettered access to emergency and other communications services, the Communications Act and Commission regulations broadly prohibit the importation, use, marketing, manufacture, and sale of jamming devices. Also, it is unlawful to advertise, sell, distribute, or otherwise market these devices to consumers in the United States. These devices pose serious risks to critical public safety communications, and can prevent the user and others from making 9-1-1 and other emergency calls. Jammers can also interfere with law enforcement communications. Operation of a jammer in the United States may subject the offender to substantial monetary penalties, seizure of the unlawful equipment, and criminal sanctions including imprisonment. After stopping the Ford pickup at the airport’s Guard Post India Gate, the FCC agent interviewed the driver, who identified himself as Gary Bojczak and who admitted that he owned and operated the radio transmitting device that was jamming GPS transmissions. Bojczak claimed that he installed and operated the jamming device in his company-supplied vehicle to block the GPS-based vehicle tracking system that his employer had installed. He voluntarily surrendered the jammer to the FCC agent upon request. Following its investigation, the FCC in 2013 found Bojczak apparently liable for violating the laws and regulations that prohibit the use of signal jammers and it proposed a forfeiture of $31,875. Mr. Bojczak fully cooperated with the Enforcement Bureau’s investigation and provided the Bureau with detailed financial information establishing his inability to pay the proposed forfeiture. A local news station reported that Mr. Bojczak lost his job over the incident. To settle the matter with the FCC, Mr. Bojczak admitted that he violated the laws and regulations that prohibit the use of signal jammers, said he would comply with these rules in the future, and was required to pay a civil penalty of $2,360. He will be required to pay the remainder of the original proposed civil penalty if the FCC finds during the next three years that he failed to comply with the jammer rules or that he misled the Commission regarding his current financial status. The FCC has previously issued Enforcement Advisories along with frequently asked questions relating to the jamming prohibition and these are available at https://www.fcc.gov/general/jammer-enforcement . On February 29, the FCC’s Wireless Telecommunications Bureau (“Bureau”) issued a Public Notice seeking comment on “additional technologies that may enhance the interference-mitigating features of signal boosters” the FCC adopted in its February 20, 2013 Signal Boosters Report and Order. Reply comments are due April 14, 2016.
an indication of whether the safeguard relies on patented technology, and if so, the identity of the patent holder. Any other related issues regarding consumer signal boosters. According to the Public Notice, comments in this proceeding will “inform whether further action” in the signal booster rulemaking proceeding is warranted. FirstNet, the National Telecommunications and Information Administration (NTIA) and the Department of Commerce have announced a $40 million grant program to facilitate the relocation of incumbent 700 MHz narrowband systems out of the 700 MHz broadband spectrum (Band 14) that predate the 700 MHz bandplan that was adopted by the FCC in 2007. The federal government notes that there are currently 15 licensed public safety incumbents in Band 14. In its grant funding notice, FirstNet stated that “[t]hese public safety entities (incumbents) will be required to relocate their communications operations from Band 14 to other frequencies allocated by the FCC to ensure unencumbered (clear- free of interference) spectrum, which is necessary for NPSBN development, and operations.” Through the use of the Band 14 grant relocation program, FirstNet and NTIA believe that public safety entities can be successfully relocated from Band 14 while at the same time being able to operate their communications systems on other public safety channels without interruption. Applications for grant funding are due no later than May 16, 2016. Further information is available at www.grants.gov under Federal Opportunity No. 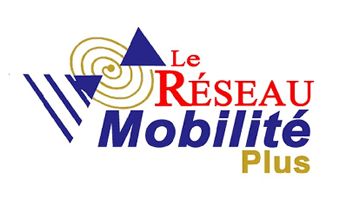 2016-NTIA-SRGP-01. The five FCC Commissioners have issued a series of joint letters to a series of associations and trade groups which request assistance in curtailing the operation of unlicensed or pirate radio stations. The Commissioners’ letters point out that the operation of pirate stations are illegal and can cause harmful interference to licensed operations – including public safety – as well as federal government communications. The Commissioners noted that there are a number of unrelated businesses and nonprofit entities that may be providing unknowing assistance to pirate stations through the purchase of advertising, or housing of radio station equipment. The Commissioners stated that aside from the fact that these sorts of actions could expose legitimate businesses to enforcement action from the FCC as well as other legal action, legitimate business reputations could be damaged. As part of its outreach, the Commissioners have also released an Enforcement Advisory, which indicates that the operation of a pirate station – which is a violation of the Communications Act – can lead substantial fines, seizure of equipment, ineligibility to hold FCC licenses and criminal penalties. The FCC takes the operation of pirate stations very seriously not only because of the potential for harmful interference to licensed radio operations, but also because it can threaten the livelihood and sustainability of existing radio broadcasters as well as the health and safety of the public. In this regard, the FCC notes that pirate radio stations can cause harmful interference to licensed radio broadcasters and prevent the public from hearing important Emergency Alert System (EAS) messages and warnings broadcast by those stations. It is important to note that while most pirate radio stations operate in the broadcast bands, it is also possible for them to operate in any band, including the land mobile frequency bands. In this regard, a station for which the license was inadvertently allowed to lapse due to inattention to the license renewal deadline or other regulatory issues technically qualifies as a pirate station, and can get dragged into the FCC’s new enforcement initiative. The FCC has granted a waiver of various Part 15 rules in order to permit the certification and operation of fixed white space devices in the 470-698 MHz band by Deere & Company (Deere) and Koos Technical Services (Koos) on certain off-road equipment. The FCC’s action will allow Koos to obtain equipment certification for a fixed white space device that will be installed on Deere agricultural machines such as tractors, self-propelled harvesting machines, sprayers, etc. that are used in various agricultural applications. The fixed white space devices will operate with the Deere StarFire geolocation guidance system. In granting the rule waivers, the FCC determined that the public interest would be served because it would provide for broadband machine-to-machine (M2M) data communications that would increase crop yields and reduce food production costs, while not causing harmful interference. Part 15 of the FCC’s rules allows low-power devices to operate without separate licensing from the FCC. In particular, subpart H allows unlicensed devices to operate on TV channels that are not being used by licensed broadcast stations. In order to prevent the potential for harmful interference, white space device users are required to obtain a list of TV channels that may be used at their location from a white space database. Additionally, white space devices must have either a geo-location capability or be professionally installed as well as be able to access a database which provides a list of available TV channels at their particular location. Under the FCC’s Rules, white-space devices must: (a) initially register with a white space database to enter their coordinates and antenna height above ground level, (b) obtain a channel list before operating and (c) recheck the database at least once a day. In the event that a fixed white-space device is relocated, or if for some reason its stored geographic coordinates are altered, the device must be re-registered. Fixed devices are permitted to operate with up to one watt output power and use an antenna with up to 6 dBi of gain to produce a maximum of 4 watts EIRP. Personal/portable devices do not need to register since they incorporate geo-location capabilities and automatically operate pursuant to the channel list provided by the database. As discussed above, Deere and Koos sought a limited waiver of the Part 15 rules to use fixed white space devices as part of Deere’s StarFire GPS-enabled terminals to provide broadband connectivity in M2M applications for agricultural operations. The Deere/Koos rule waiver request is applicable only to fixed white space devices because (a) the Koos device is designed to meet the technical rules for fixed white space devices and will only need to be modified to accept geo-location data from an external source rather than an incorporated geo-location capability or through professional installation, (b) the white space devices are programmed to calculate channel lists for fixed white space devices operating with up to 4 watts EIRP and (c) the databases are required to collect and retain registration data for fixed white space devices only. The FCC found that the Deere/Koos request would serve the public interest by allowing Deere equipment to be used more efficiently in agricultural operations without causing harmful interference to other broadcast or radio operations. The FCC noted that a significant amount of farmland is located in rural areas where reliable wireless communications may not be available, but where a significant amount of white space spectrum in the 470-698 MHz band is abundantly available for broadband uses such as that proposed by Deere. Amateur (ham) Radio capabilities serve as a vital source of communication during emergency situations. To help support communication efforts in the county during times of need, the Dakota County Amateur Radio Emergency Service (ARES) in partnership with the Dakota County Emergency Management provided a ham radio operator technician course earlier this month to interested community members. The course was offered to prepare attendees for the Federal Communications Commission (FCC)’s ham radio operator licensing testing to help expand communication resources in the county. Dakota County Emergency Management is currently working on Standard Operation Guidelines and Standard Operation Procedures with local ham radio operators to explore how the county can efficiently utilize their services in an event of emergency. Emergency Communications during disaster events are not 100 percent fool-proof. ARES was created in 1935 by the American Radio Relay League (ARRL) to provide any type of radio communications support to public agencies such as the Red Cross and the National Weather Service (NWS) in times of need. In most disasters traditional communication systems generally fail, cellular systems are quickly overloaded and traditional telephones and internet systems are plagued with interruptions and outages. When all else fails, amateur radio still works to provide communication support when it is needed most. Ham radio operators serve as a backup system of communicators and equipment that get messages through, wherever and whenever they are needed. During disasters, ham radio has proven invaluable in maintaining both local and long distance communications. 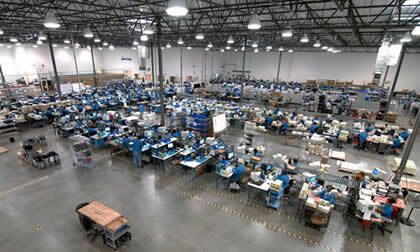 Nearly 30 individuals participated in the course and will be testing for certification on Monday, March 28. Reider said the Dakota County ARES and Emergency Management hopes to offer more Ham Radio courses in the future to add more resources to the Emergency Communications Team. In addition, the Dakota County Emergency Management and Dixon County Emergency Management will be holding a Severe Weather Awareness Training from 7-9 p.m. on April 28 at the College Center in South Sioux City. This training is open to the public and there is no cost to attend. For more information please contact Beckman at dbeckman@southsiouxcity.org or 402-750-1905. I-SKY… the Independent Skywarn Weather Observers of Southern Oklahoma and North Texas. The I-SKY Facebook group is my contribution to help promote and support the NWS SKYWARN Program and protect its integrity based on traditional core values and principals that made it popular back in the 1970’s and 80’s. The first “storm spotters” began with the National Weather Bureau back in the 1940’s to train military and aviation “lightning spotters” in areas near munitions manufacturing and storage depots to provide warnings when lightning storms were approaching so workers could evacuate to safety in case lightning stuck the facility, which could result in explosions causing injuries and loss of life. In 1942 a serious tornado involved a key operations center in Oklahoma and another tornado destroyed parts of Fort Riley in Kansas in 1943. After these two events and a string of tornado outbreaks, spotter “networks” became a commonplace, with an estimated 200 networks by 1945. The mandate had changed to include reporting ALL types of active or severe weather, from giving snow depth reports during the winter to fire reports in the summer along with the more typical severe weather reports associated with thunderstorms. It was not until 1947 that “volunteer spotting” as it exists today was born. After a series of tornado outbreaks in Texas in 1947, the state placed emphasis on volunteer spotting and the local weather offices began to offer basic training classes to the general public. Spotting required the delivery of timely information so that warnings could be issued as quickly as possible, thus civilian landline phone calls and amateur radio operators provided the most efficient and faster means of communication. While phone lines were reliable to a degree, a common problem was loss of service when approaching storms damaged phone lines in its path. This eventually led to amateur radio being the main communication method and resulted in the installation of special amateur radio work areas within the local weather service offices. The 1950’s saw the deployment of the first dedicated weather radars in the United States, and by this time civilian spotter networks were commonplace. The new reflectivity-only radars provided meteorologists with basic information and helped identify potentially severe storms, but due to the nature of weather radar, most precipitation was detected a height of 1 kilometer or more above the ground. Ultimately, the radar cannot see exactly what occurs at the surface of the earth, and storm spotters now correlated “ground truth” reports with radar signatures. New spotter technologies and training techniques have been developing since the 1960’s. Prior to 1960, the vast majority of amateur radio communication relied on “AM” modulated signals and the use of “simplex”. After 1960, amateurs adopted the use of “FM” and the use of repeaters which offered more reliable communications without the static crashes associated with using “AM”. By the 1970’s, nearly all radio spotter activity used amateur repeaters, while some rural area “civil defense” spotters used “CB” radio. The next major technology to aid spotters was the development of the “cell phone” in the late 1970’s and early 80’s. It then made it possible for non-amateur radio operators to report severe weather directly to the weather service or to their local “civil defense” office. Storm spotting became more popular with the public during the late 1980’s and early 1990’s. During this period, a number of projects carried out by the National Severe Storms Laboratory, some of which were documented and broadcast on television in a number of special telecasts. Spotters and their actions were attributed to saving lives as well as aiding university research groups, who would drop sensors such as TOTO in the path of tornadoes and at times fire “rocketsondes” directly at or very close to tornadoes. At about the same time, early “storm chasers” were popularized and associated with spotters. It is believed this association is what led many in the present era to associate storm chasers and storm spotters as carrying out the same actions or having the same goals. Technology advances such as the Internet, weather radio, pagers, and cell phones have made spotter activation quick and efficient, however, the basic goal of spotting has remained unchanged to this day. The primary group responsible for storm spotting in the U.S. today is known as “SKYWARN”. Many individuals hold Skywarn “certification” and/or amateur radio licenses. Other spotters are part of organized local spotter groups, reporting their observations to the local emergency management office or to the National Weather Service office responsible for that area. A Skywarn group can be either directly OR INDIRECTLY affiliated or associated with the local weather service office, and could include employees or volunteers of local agencies such as volunteer fire departments, law enforcement, emergency management and emergency medical services, “cert” groups, and independent ham “Skywarn Associations”. Today, amateur radio still plays a key role, as most spotters opt to attain their radio licenses, however, cell phones are an ever increasingly means to directly relay information along with other ON-LINE spotter reporting protocols such as the Spotter Network, Twitter and Facebook. While there is no question that storm spotting has saved many lives and aided weather agencies greatly, there is a concern that storm spotting and chasing actually put individuals in danger. It is a common practice for many spotters to leave their vehicles or places of shelter to better observe, but this also places spotters in situations where they can be injured or killed by lightning. Although incidents of near misses and tornado, hail, wind and lightning impact occurred, there were no known spotter fatalities caused by weather until May 4th 2007 when a large wedge tornado near Greensburg, Kansas killed a sheriff’s deputy. On May 31, 2013 engineer Tim Samaras, his son Paul, and meteorologist Carl Young of the TWISTEX project became the first know storm chaser or meteorologist deaths when a violent tornado struck near El Reno Oklahoma. Other chasers including a team from The Weather Channel were injured and at least one other amateur chaser was killed. With that little history lesson in mind, we can see that technology has played and will continue to play a huge role in weather observation Today spotters and especially storm “chasers” are often equipped with both the latest cell-phone technology and amateur radio, plus on-board computers with radar imaging at their fingertips, and can stream LIVE video of severe weather as it is happening. As technology continues to advance including improvements in weather radar such as the recent Dual Polarity upgrade, experimentation of Phased Array radar, and installation of CASA radars near larger metro areas, the role of the spotter may appear to be less significant when you can sit in the comfort of your home and watch live coverage of a tornado on TV, however in reality that just isn’t the case. There will always be a role for amateur radio spotters and local nets, especially in the more rural counties and areas where spotter reports from a ham spotter net may often be the only reports available to local emergency managers to use in their warning decision process. I guess what irks me the most today is the huge division among amateur radio operators when it comes to local spotter nets over nothing more than being “affiliated” with some “ARES” or with emergency management group. Individuals that choose to be only storm spotters should not be subjected to lot of nonsense NIMS courses or a CERT program (which is just a spin-off version of what “civil defense once was) that has absolutely nothing to do with their ability to provide a weather observation report. A report from a ham that has attended spotter training is a TRAINED SPOTTER REPORT and those affiliated with ARES or who represents emergency management that chooses to ignore a report from a spotter simply because they are not “affiliated” with “their” group is not only inexcusable and irresponsible, it destroys the integrity of the Skywarn program and its traditional core purpose and principals the program represents. I often see individuals wearing SKYWARN shirts and hats, some have SKYWARN Photo ID badges, and I often wonder if they really know what the SKYWARN logo represents. Its not about the person wearing the logo, its about the people we are supposed to help protect. In all my years as a spotter (since 1973), and serving my hometown civil defense as a spotter for over 25 years, and as their director for over 10 years, I was proud that our community never had any weather related injuries or deaths on my watch, and that the few spotters we had back then always returned home safe. That in a nutshell is what SKYWARN is really about. Additional clarification may be in order relative to my somewhat negative comments of several weeks ago. Two things should be clearly understood. First, I have the highest regard for both you and Jim. I consider you to be friends. Second, I was not condemning the actions of either of you — but to simply point out the need to adapt to things as they are, not as we wish them to be. Jim overlooked a truism known by the blacksmiths and buggy builders. Every generation faces changes. The message is the same today and it was a hundred years ago. To continue through “changes” the blacksmiths became tool and die makers, metallurgists, and manufacturers. The buggy builders (some of them) became transportation manufacturers (automobiles, delivery vehicles, rail cars etc. Remember GM's body by Fisher?). So what's the point? The point is that none of your readers are buying Jim's camera because he overlooked a basic principal taught by Dale Carnegie to many former Motorola folks. To wit, there are four elements to a sale — Interest, Desire, Conviction, and Close. You can't publish a picture of a product and a price with an expectation of making a sale. You HAVE to address all four points. Price alone won't do it. People buy VALUE, not products. (What does it do, why do I need it, and how can I get it? — The Tesla automobile is a good example). So what did you do wrong? You encouraged your readers to support your advertisers. That is a noble thing to do. Many, maybe all, of your advertisers are supporting YOU because they like what you do and they have products or services that might be beneficial to other readers or people they know. If the advertised product is something they want or need, that would likely buy it from someone they know ( i.e. other advertisers in your publication). But, if they neither want or need product, they won't buy it from your advertiser or anyone else. So the reason for my comments was not to discourage, but encourage you, Jim, and others to the need for offering VALUE in everything we do. Then, we'll all do what we do a little better. As for my comments on the end of work. This is a realty that I cannot change. Biblical students understand why it is happening and the ultimate result. There are three basic tenants for happiness — Something to do, someplace to go, and someone to love. Those who have all three have nothing to worry about. . . Divisions of A2Z Communications, Inc. Using voice commands while driving feels safe. After all, your eyes are on the road, and your hands are on the wheel. But according to AAA’s latest research, you’re more distracted than you think. 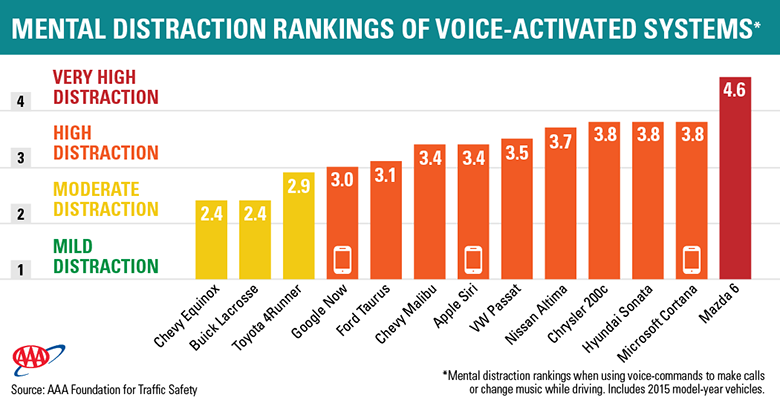 A joint study from the AAA Foundation for Traffic Safety and University of Utah confirms that voice-activated technologies can cause significant distractions and impair driving. After testing the in-vehicle information systems of 10 cars and the voice assistants of three smartphones, researchers found that all of them were cognitively taxing enough to be potentially dangerous—even up to 27 seconds after drivers finished using them. This study was the third phase of the AAA Foundation for Traffic Safety’s comprehensive investigation of cognitive distraction behind the wheel. Such distractions can slow reaction times and cause inattention blindness, resulting in drivers unknowingly missing objects on the road, such as stop signs, pedestrians, or other cars, which can lead to a crash. Participants were asked to perform various voice-activated tasks while driving 2015-model cars, such as selecting music, placing a phone call, or dictating a text message. Cameras and other monitoring equipment measured the level of distraction drivers experienced while using the systems in question. Among other things, researchers wanted to see how various voice-based systems affect mental focus, as designs differ significantly between manufacturers. After observing how drivers performed using the 10 vehicle models and three smartphone systems, researchers assigned a distraction rating to each one based on the category scale used to rate hurricane strength. Category 1, the lowest, indicates a level of distraction similar to listening to the radio, while Category 5 corresponds to a highly challenging, scientific test designed to overload a driver’s attention. All the voice systems tested were found to be Category 2 or higher, and 10 of 13 were Category 3 or higher. AAA considers any distraction at or above Category 2 to be unsafe; none of the systems met this threshold. Researchers found a direct link between system intuitiveness and distraction: As systems became more complex, took longer to use, or had more errors, drivers became more distracted. Drivers were tested before and after a one-week practice period. The second tests showed that practice reduced but did not eliminate the mental distraction caused by these systems. Interactions that were easy on the first day were still easy; difficult ones remained relatively difficult. Another, more surprising discovery was that drivers weren’t just distracted while carrying out voice-command tasks. Cognitive focus was impaired even after tasks were completed: The most distracting systems left drivers with unsafe levels of distraction for up to 27 seconds, while even the least distracting systems still left drivers shortchanged for at least 15 seconds. That means drivers who use voice commands at “safe” times while stopped in traffic or at a red light may still be distracted when they start moving. It’s concerning that hands-free systems, often seen as a way to avoid distracted driving, can contribute to it instead. The good news is that there are ways to make systems less distracting. While no devices met AAA’s threshold for safety, the three Category 2 systems demonstrated that good design decisions can make voice-command tasks less distracting. Design systems that are simple yet robust. Flexible, error-free systems tend to have lower workloads than rigid, error-prone ones, so usability testing to better understand users’ needs and minimize system errors has the potential to reduce cognitive demands on drivers. Strive for Category 1 systems. More research is needed to determine if mental distraction levels from voice-assistant technology can be reduced to levels on par with listening to the radio or an audio book. Be aware of the risks. The high mental workloads observed in this study should serve as a caution that voice-based interactions in the car can still be very distracting, even if doesn’t necessarily feel like it. Weigh whether a voice-activated task is necessary. Drivers should stick to commands involved in operating the vehicle, such as adjusting the radio or climate controls. Social media, text messaging, and email can wait. Reconsider voice-activated tasks when stopped. 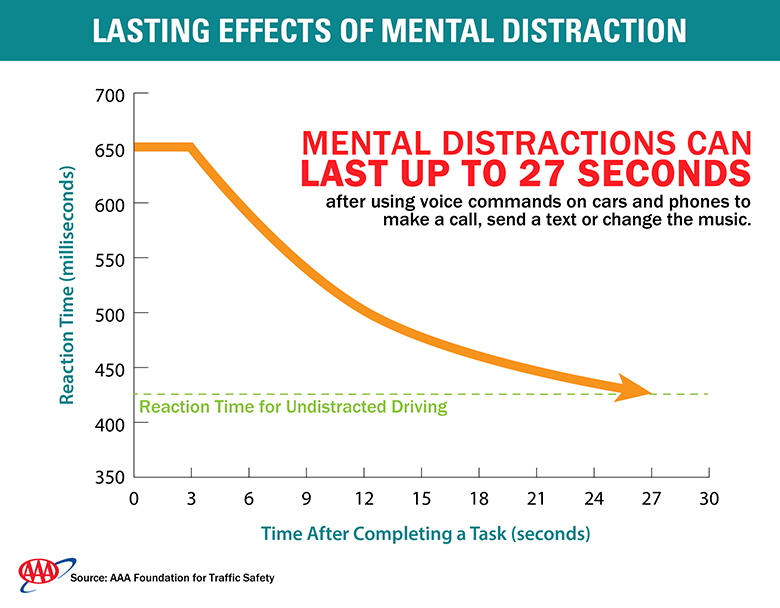 Since the research found that distractions from hands-free systems can persist up to 27 seconds after completion, drivers shouldn’t assume that using them while stopped is safe. Distraction may linger even once they begin driving again. Information taken from “New Hands-Free Technologies Pose Hidden Dangers for Drivers,” AAA Foundation for Traffic Safety, October 22, 2015. Shirley Saathoff of Brandon [Minnesota] snapped this photo of her German shorthaired pointer, Hailey, posing in the perfect point while Saathoff and her husband, Daryl, were hunting at Elk Lake Heritage Preserve north of Hoffman. 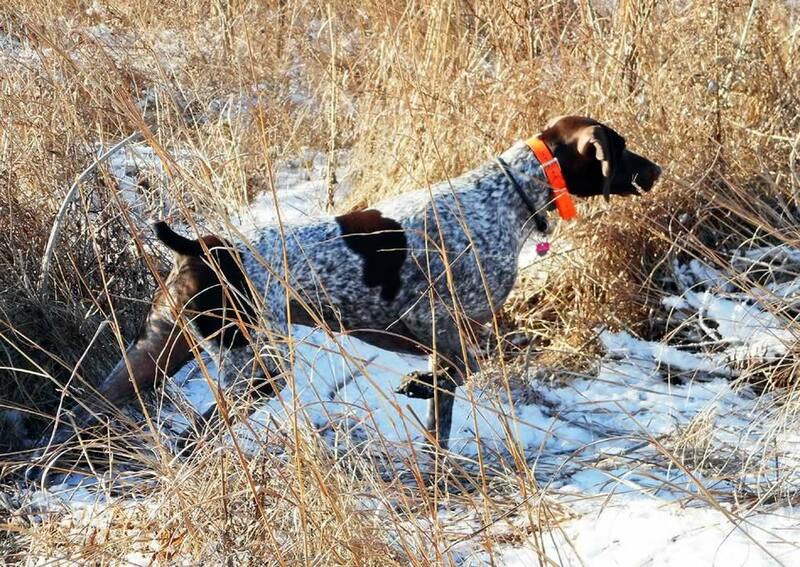 The German shorthaired pointer breed has webbed feet and is known for hunting waterfowl. Posted on Mar 25, 2016 at 12:00 a.m.
Brown the hamburger in a large pot. Stir it well and break it up into small pieces as it browns. Add tomatoes, tomato sauce, pinto beans, salt, chili powder, and bay leaves. Stir it all together. I cook the Bell Peppers and the Onions separately as they have different cooking times. I tried sautéing them together but when the onions were done (translucent) then the Bell Peppers were too done (mushy). They both need to be cooked before they are added to the pot of chili or they just don't turn out right. I hate to see pieces of onion floating to the top. Clean and chop the onions into small pieces. In a frying pan sauté the chopped onions in 1-2 tablespoons of canola oil until translucent. Add the cooked onions to the pot of chili. Clean and chop the bell peppers into small pieces. In a frying pan sauté the chopped bell peppers in 1-2 tablespoons of canola oil until tender. Add the cooked bell peppers to the pot of chili. Stir everything together and bring to a light boil. Reduce heat to low, cover and simmer for two hours. For thinner chili, add one to ½ cup water (not highly recommended — this is chili con carne, not chili soup). Remove the bay leaves before serving. This makes a large pot of chili. You can reduce the ingredients by ½ for a smaller batch. Serve chili in soup bowls with fresh oyster crackers. Grate sharp white or yellow cheddar cheese on top of the hot chili.